It’s that time of year again! I’m gearing up to see all my wonderful clients in their adorable holiday outfits! Here’s all the details for these sessions! Free additional (1) digital image for everyone who shares this announcement on their Facebook page! The 2 top mini sessions must take place within 7 miles of 33629 (South Tampa) or you may add a $35 travel fee which covers up to 25 miles from my home. Pinellas beach locations are only available for Option 2 & 4. The top 2 mini sessions will be limited to 45 minutes. Sessions will take place either 1st thing in the morning or approximately 1-2 hours before sunset. Digital files (full resolution) are sent via website link for instant download. Payment is due in full to reserve your date. 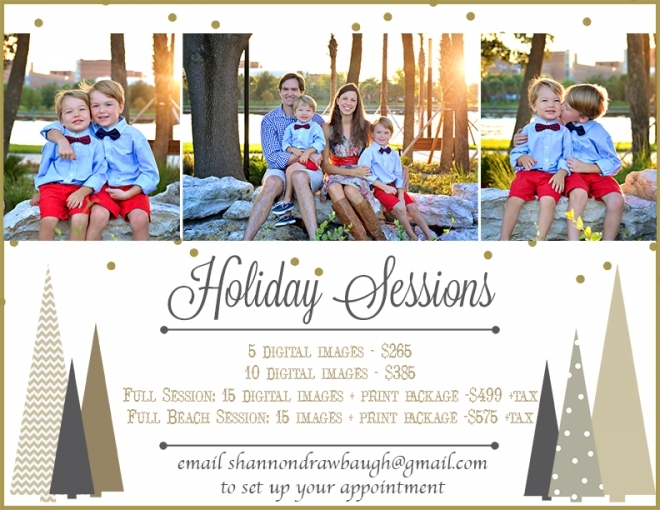 Holiday Session offers are good from October 1st – December 31st 2015. Turnaround time during the holidays is approximately 3 weeks so please plan accordingly for proper timing of sending out your holiday cards. These special offers only apply to family, children & maternity sessions. Does not apply to newborn sessions. Fridays, Saturdays and Sundays always go 1st so if you need a weekend appointment, please book early! *A special thank you to the K Family for letting me use their photos in my announcement!